It’s the bane of freelancing existence – getting paid late. At best, dealing with that wastes valuable time that could be spent working or enjoying your life. At worst, late payments mean that you’re unable to pay essential bills like your rent. Chasing late payments is a huge problem for SMBs and freelancers. If your clients are not paying you on time your cash flow will be off, and your business could be in trouble in the long run. And because almost every single freelancer has or will experience what that feels like, we made a list on how to deal with this situation, how to prevent it and we have a few template for send payment reminders. Preventing a problem is often times better than trying to solve it once it has already occurred. This is also true when dealing with late payments. The best way to do that is with a good contract. Establish when the payment is supposed to come. Getting money upfront, once half of the work is finished or having milestones across the project if it’s longer, are all sensible business decisions. It might take some work to see which works best for you and to convince your clients, but it’s well worth it. Secondly, make sure that you don’t shoot yourself in the foot. A common mistake with freelance writers is to have a clause that says you get paid when your work is published. But imagine you submitted an article six months ago and the client is just now including it in their newsletter – that’s neither your fault nor is it your job to place your content. Be wary of those tricks. If the prevetion phase didn't work it's time for you to follow up with payment reminders to your client until you receive your payment. How do payment reminders work? A payment reminder is the creditor's specific and explicit request to his debtor to provide the service owed (in our example, payment for services provided by the freelancer). There are no special legal requirements or particular formats for reminders. So, the reminder can be made in writing (via letter, fax or email), and/or verbally (via phone call or stopping by the client’s office). Generally, entrepreneurs think that they have to admonish the debtor three times before they can take legal action. However, after the first reminder, the debtor is already in default. That means he has to take over all other costs that the prosecutor incurs by chasing the late payment. 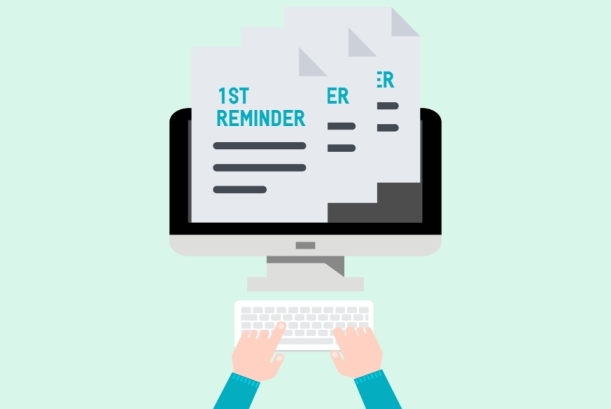 After the first reminder (which is often called “the friendly reminder”) is sent, the debtor will expect that there will be more reminders before he actually has to pay. As we said, this is also what entrepreneurs generally think. How does this work in the sphere of freelancing? You have completed your order on time and in a professional manner and have invoiced the customer accordingly. But the customer does not pay by the due date. This isn’t something about which you can be blasé or that can be ignored. So here are a few templates to chase that late payment! Now we get into the timeline of chasing after money that should have already been sent to you. The beginning of that should be nice and simple. Just send an email or contact the client like you usually do. Ask them if they got your invoice, whether or not they liked the product and inquire when you should be expecting your money. If the client doesn’t pay you by the due date, it’s time for you to get in touch with the so-called “first reminder” or “friendly reminder”. The exact time that you contact the client is up to you; it can be a day after the due date or a week after the payment was due. As a rule, the first reminder is written in a polite and friendly manner. A deadline is not necessary, nor the threat of certain legal consequences. It is enough if the creditor (freelancer) clearly states that he or she now expects the payment from the customer as soon as possible. You will be able to think of consequences later if the client still ignores your request. In order to give your customer the opportunity to comply with the deadline, this should expire on a working day. The intent of this first letter is to get paid so give your client the chance to see your e-mail or letter. Do not forget to keep it natural and friendly as you still don't know what the resaon for the late payment is. Invoice go past due for many more reasons as just simply not being willing to pay, so don't take it personal (at this moment) and try to fight for a future long relationship with the client. If the first reminder period has expired without you getting any payment, send a second reminder to your customer. The format for a second reminder is similar to the first reminder. It includes information regarding the project, the client and your information and payment details. The time interval between 1st and 2nd reminder depends on whether a payment deadline has already been set in the 1st reminder. If you have not set a payment deadline in the first reminder, it is normal to wait about 10 days before sending a second reminder, but of course this timeframe is just a suggestion and you decide the interval for your own business. Do not forget what we said in the additional tip under the first reminder: make sure that the deadline is during the typical work week. As the client was already notified that there is an amount overdue, the client is obligated to pay not only the principal invoice amount but also additional fees that might arise(interest and late fees). Hint: We’d recommend you to include a late fee up to the second reminder. The late fee amount should rise according to the efforts needed in chasing the payment. It can be as little as five dollars to a percentage of the amount due. Alternatively, go make that call and inform them that you’re still waiting to get paid for the work you did. Some people really need to be reminded twice, especially when it comes down to owing money. If the payment is still overdue and your client doesn’t react to the second reminder, you must go further to a third payment reminder. The third reminder is sometimes referred to as the “last reminder” or “demand letter” for payment. This last letter will be sent after the deadline set in the second reminder passes. If you didn’t set any deadline on the second reminder, you could consider an interval of about 15 days. In the third reminder, one will unequivocally set a final deadline for payment and inform that further legal action will be taken in case of no payment. Informing your client on this third reminder will make him clear that this is a serious business issue and that it’s not okay to ignore your previous reminders. Bill the customer separately for the interest incurred and late fees. The third reminder period should be the shortest (we suggest a 5-day deadline). Hint: Things are getting serious. This is when you escalate the issue. The regular contact at the company isn’t willing or able to pay you. Call his superiors. They might not have gotten the notice and most certainly have more power in the company to actually get things done. You might want to try the accounting department, too. At this point, you might be struggling to pay your bills or simply angry that you needed to go this further with the client to get paid. However, although the friendly tone from the 1st reminder might be gone, you need to keep it professional. You shouldn't show your angryness but showing the client that they have one last chance to do what they should long have done. Often, as you are introducing them to a debt collector o a lawyer, the client will finally send the payment. After this point, if there is no response, legal action must be taken. Do not allow clients, no matter how big or important, to walk over you and delay the payment you deserve. Things are getting pretty rough when you haven’t gotten paid for eight weeks. The response should escalate accordingly. Both option A and B aren’t too nice, but can be done nicely. Option A is to bring up the issue in public – nowadays that means Facebook or Twitter. Sending out a message that the whole world (including other freelancers) can see, is damaging to a company. Many will try to alleviate the issue as soon as possible to avoid bad reputation. When even that isn’t enough and the sum you are owed is significant (think upwards of 5,000 US dollars), getting a lawyer might be a bittersweet option, but it might also be the only one you have left. Be sure to consider how much time and money lawyering up will amount to, because it might just not be worth it. But if it, go for it – you have a contract and help up your end of it – the client should hold up theirs. Use these templates and tips to get your point across in a way that is both assertive and professional! Get paid! How do you deal with getting paid late? Let us know in the comment section below! Sure good tips, but get receivable insurance not payday loan style e.g. EulerHermes, Coface. One CFO attempted to stiff me on 10% because $7K was his completion line. In other words, he over promised on budget facts, and at 90% wanted to re-negotiate. It costs his company 8 times that on replacement personnel, policy transactions. and reputation damage. I learned never pick narcissistic financial officers, behavior does matter. Good notes, good approvals, good work, and get out of there, good job done. A CFO's bonus award, appetite, and expense is for another subject; just understand behavior because s/he may be speaking to a public investor. Be well and good insurance program will handle this. You will see risky factors before getting involved with some companies.